Cotton socks specially designed for diabetes people help the legs’ comfort a lot. They do not sweat nor become stuffy, they stay smooth, so they do not disturb feet and remain loose around the ankle, so they cannot prevent the swollen legs circulation. These cotton diabetes socks without rubber are comfortable both for men and women. Socks without rubber are essential for people with diabetes and circulatory insufficiency, swollen legs. 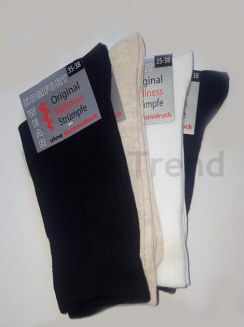 They are called medical socks as well since their pure cotton material is easy to wash, comfortable to wear for a person with leg problems or of an old age. Diabetes socks without rubber are a pleasant, everyday wear for both women and men, they touch toes beautifully and without any breaks, legs do not sweat in them. Look at our socks recommended for diabetes people, you cannot find so many anywhere else!